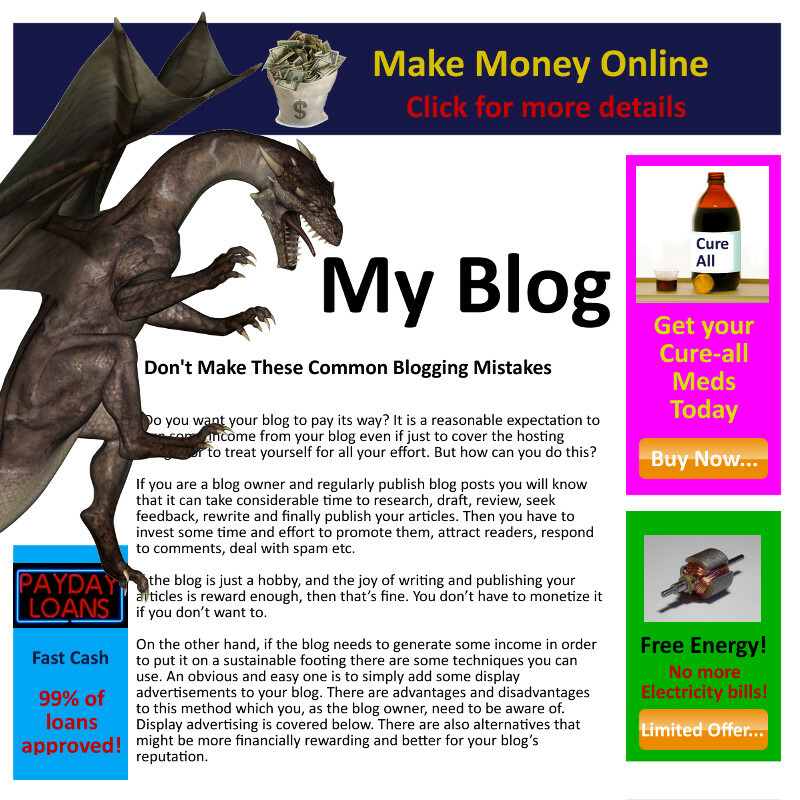 On the other hand, if the blog needs to generate some income in order to put it on a sustainable footing there are some techniques you can use. An obvious and easy one is to simply add some display advertisements to your blog. There are advantages and disadvantages to this method which you, as the blog owner, need to be aware of. Display advertising is covered below. There are also alternatives that might be more financially rewarding and better for your blog’s reputation. If the blog is just one part of your website, and your website is for a business entity then it may not be appropriate or necessary to show advertisements on the blog. Attracting visitors to the blog could be a big enough win. After reading the blog, visitors may be encouraged to read other sections of the website and discover the products or services offered by your business. They may even become customers as a result. If, however, the blog is the website it may be worth looking at a range of ways of generating income from it, and that’s what the rest of this article will explore. The leading Internet search engines and advertising networks offer publisher programs (e.g. Google AdSense) which website owners can sign up to. They provide the website owners with some code snippets to be placed onto their web pages. When these pages are viewed, banner advertisements appear. The website owners earn some money (typically a few cent) when a visitor clicks an ad. That seems easy enough, so what’s the problem. Where are the dragons? The choice of which ads to show is made by the ad network, not by you, the blog owner. You run the risk of ads for competitors being shown. The ad network may provide you with a way to exclude ads from certain advertisers, but this can be time consuming to do thoroughly and may have to be updated regularly. Your readers may assume that you somehow “endorse” the products or services advertised on your website, yet you don’t even choose the ads which are shown. We’ve all seen some ads online for products or services which we wouldn’t want anything to do with. How would you feel about some of these appearing on your blog? Ads from such networks can pose a threat to your reputation and to that of your blog. Display ads can be a distraction – especially if they pop-up, flash or play audio/video automatically. This can be a real turn-off for readers who simply want to read your article. If you don’t read the fine print of the terms and conditions of the ad platform, you may find your account blocked and earnings stopped. If not done carefully, display advertisements can make your blog less attractive visually. The first impression for a visitor may not be a good one. Site design is important if you want your visitors to trust the site and have confidence in it. Visitors looking for particular information may visually ignore banner ads, particularly if they are under time pressure. This is known as Banner Blindness and it reduces the chance of visitors clicking on such ads. This reduces your income. Only a tiny fraction of your visitors will click on a display ad on your blog. The number of ad clicks per visitor is decreasing over time as visitors increasingly ignore the ads or use ad blocking software to prevent them showing in their web browsers. Unless your blog is attracting huge numbers of visitors, you should not expect to earn more than peanuts from display advertising. Looking at some numbers: if your display ad click-through-rate (CTR) is 0.1%, and you are lucky enough to get 50 cent per click, then you need 1,000 unique visitors each day to earn just 50 cent. There are better ways. Distracting display advertising run the risk that readers start to read your blog, but shortly thereafter, a display ad grabs their attention. They click on the ad, and are gone. They may never finish reading your thoughtfully-written article. Is All Display Advertising Bad? The above is not to suggest that you should not use display advertising on your blog at all, although some purists would advocate just that. Display advertising, in moderation, can be one of several monetizing methods you can use. Using more than one method enables you to evaluate how each method is performing and to make adjustments to your mix of monetizing methods based on your measured results. I’m sure you’ll agree that in order for your blog to be successful it must be helpful to the people who read it. By publishing helpful articles regularly, your readers will come back regularly. Obviously the most important part of the article is the content itself. If you wish to monetize the blog in some way, then wouldn’t it be good to be able to do it also in a way which helps the readers? That way, the monetization aspects will be seen as being less like an intrusion and more like another form of help. Work with specific advertisers or merchants whose products or services would appeal to or help your readers. By joining a network such as the Vendexo Affiliate Network, you can be paid a commission when you refer a visitor to an advertiser/merchant’s website and they make a purchase. You can do that by hyperlinking certain words in your blog (for example, product or brand names) with the affiliate links which you get from the network. It’s nowhere near as visually intrusive as a banner ad, and it forms part of the blog content. You can also hyperlink buttons or images too if that suits the context. This is a form of in-content advertising. Because it forms part of the article content, it is less likely to be unseen by the readers or to be blocked by ad blocking tools. One of the disadvantages of banner advertising is that you have no control over the choice of ads which are shown on your web page, their suitability for your readers or your blog’s brand or image. With the Vendexo Affiliate Network, you can still show text or media ads, but you can choose which ones. This puts you in control. Rather than advertising directly on your blog, use your blog to build up a list of the e-mail addresses of your readers. Readers may give their e-mail address to join your newsletter or to receive a free e-book for example. You can use the e-mail list to notify them of new articles and you can include some advertisements or promotional material in the e-mails. The monetization aspects are thus kept out of the blog and limited to the e-mail channel. You must include an unsubscribe link in such e-mails, and do keep the advertising aspects small, unobtrusive, relevant to the e-mail content and helpful to the recipient. Physical products, such as your own range of make-up, stationery, craft-products etc. E-books which conveniently capture your expert advice and knowledge. Services such as training, consultancy or to perform work related to what your blog is about, or even to help others set up a blog and to write articles. Sponsored articles: You publish an article on your blog for a fee. It could be an article about a new product or product range, and it would be beneficial to the advertiser to make your readers aware of it. The advice on this is to make it clear to your readers that this is a sponsored post – label it as such. You should also make it clear to the advertiser and your readers that the opinions expressed in the article are your own and are honest. Don’t sacrifice your reputation for a sponsored article. You work hard to build up the trust of your readers. Ultimately the choice of whether, and to what extent, you show advertisements in your blog is a decision for you as owner of the blog. I hope that this article has helped you to see that there several different ways to earn an income from your blog. Why not try some of them out and see which works best for you and your readers? Remember, that if you publish sponsored articles or include in-content advertisements or promotions, do label them as such e.g. “Ad”, “Advertisement”, “Promoted”, or “Sponsored”. You also need to disclose to your readers if you receive a fee or commission for mentioning, reviewing or promotion certain products or services in your blog. Ideally, you want your reader to read your article all the way to the end – after all the effort and care you put into writing it. If you want the reader to do some monetizing action (something which is beneficial to you or results in a fee or commission for you), it is at the end of the article that you want to place such a Call-to-Action. For more ideas on improving your blog, you’ll find lots of suggestions in What Makes a Good Blog Great? (Blogging Tips). That’s one call-to-action, right there! If you found this article helpful, then please share it using the links below. Thank you. This entry was posted in Affiliate Marketing and tagged advertising, affiliate marketing, blogging, monetizing by vendexo. Bookmark the permalink.